Christine Chen is a customer service expert, professional speaker, consultant, and trainer. She works with companies and organizations who want to build exceptional service cultures, connect people, increase revenue, and enjoy long-term stability. The Manners Lab is the youth division of Ms. Chen’s corporate business. (www.TheMannersLab.com). Read Christine’s extended version here. 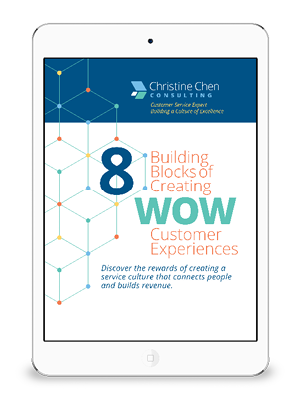 Christine Chen is a customer service expert, professional speaker, consultant, and trainer. She works with companies and organizations who want to build exceptional service cultures, connect people, increase revenue, and enjoy long-term sustainability. In 2010, Christine founded Global Professional Protocol (GPP), a comprehensive professional development firm committed to providing contemporary and relevant protocol, etiquette, and customer service training to today’s professionals and businesses. Recognizing the changing dynamics of businesses, in 2015, Christine rebranded GPP to Christine Chen Consulting which focuses on building exceptional cultures within organizations. Prior to building a professional training organization, Christine founded Modern Manners in 1997. In 2016, Modern Manners was rebranded to The Manners Lab (TML) where training tomorrow’s leaders is the key focus. By educating children, teens, and young adults in all areas of social skills, TML is building skills that last a lifetime. Along with Jan Fox of Fox Talks, Christine created, in 2013, Everything About You (EAY), a seminar series for professional women that focuses on public speaking and professional image. Christine is a speaker, trainer, author, and media expert. She has worked with healthcare facilities, major corporations, entrepreneurs, and educational facilities for the past 15+ years. Some of her clients include George Washington University, AT&T, Wells Fargo, Xerox, Philips Healthcare, Phoenix Children’s Hospital, and Schulman Rogers. Professionally trained by The Protocol School of Washington, she has a clear understanding of the ever-changing rules of protocol in today’s society along with the importance of world class customer service. As a graduate from the Cappa Chell Finishing School, she brings expertise in the area of making the first impression that counts. With a bachelor’s degree in Organizational Management and as a certified practitioner of the Myers Briggs Type Indicator assessment, Christine brings out the importance of understanding the need for positive relationships between employees and customers as well as the need for team building within the organization. Along with speaking engagements across the nation, Christine has been a regular guest on News Channel 8 “Let’s Talk Live,” where she shares her expertise in the skills needed to excel in today’s competitive business arena. Additional credits include appearances on CNN, D.C.‘s Fox 5 News, Ministry in Motion TV, and radio interviews on WGTS 91.9 and “It’s Your Biz” with Susan Solovac. She has written for several magazines and publications nationwide including Personal Excellence: The Magazine of Personal Leadership. She also served as a monthly columnist for Recipes for Good Living Magazine and Georgia Family Magazine. Christine’s passion for children and quality education led her to meeting the need for a school in her area. She co-founded Olney Adventist Preparatory School (OAPS) in 1997. Olney Adventist Preparatory School is a thriving school with over one hundred students and consistently rates in the top 97% in nationwide standardized testing. Christine’s passion for shaping tomorrow’s leaders is evidenced in her work at OAPS where she has volunteered her consulting services since 1997. Christine also served as School Board Chair from 2003-2011.